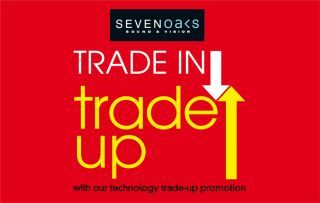 Sevenoaks’ Technology Trade In ends this week – don’t miss out! | What Hi-Fi? If you find yourself saying this sort of thing about your hi-fi or AV equipment, you may have the wrong hi-fi or AV equipment. This gear is supposed to entertain and inspire you with incredible sound and images, not simply ‘do the job’. It could be time for a change – and if so, Sevenoaks Sound and Vision’s Technology Trade In can help provide it. If you have a qualifying CD player, amplifier, speakers, AV receiver or wireless speaker that you want to upgrade, you can part-exchange it for the latest equipment from NAD, Bluesound, PSB, Yamaha and Denon, offsetting a hearty chunk of the cost. For example, you could trade in your old analogue AV amp for a Yamaha RX-A670 with 7.2-channel Dolby Atmos, saving £100 in the process. Or you could trade your old stereo speakers for £150 off a Bluesound Pulse Soundbar, making it a cornerstone of a new multi-room music system (and a very fine home cinema solution to boot). So, you get the latest new kit for less, and find a new home for your outgoing gadgets at the same time. Double win. The offer only works in store, so click here to find your nearest Sevenoaks Sound and Vision shop. And remember, you’ll need to hurry – the Technology Trade In ends this week!